It is said that the Chinese brought painting to Europe. But they only knew watercolor. In teaching them oil painting, we gave them as much and more than they gave us and even more than they think, that is, the possibility of restoring to an aged art a new sap with its racial character, if not its primitive force. 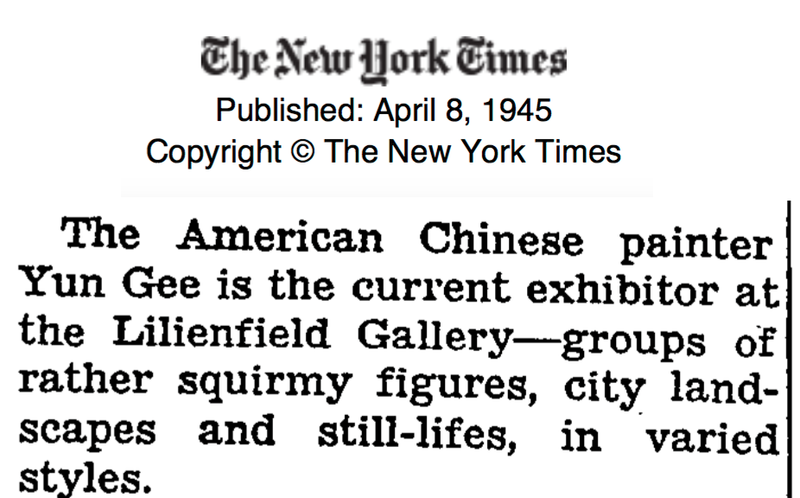 That is what appears very definitely in the paintings of Yun Gee. He passed through London and New York and those influences are visible. His art has that stripped appearance which is the distinction of the English and American schools. But he came to France where he found the richest and most varied impressionistic palette at the same time as he found Picasso’s acrobatic simplification. He added to these the patience and thoughtfulness of his race – that taste for pure and honest color which has remained with the potters of his country. All art is summed up in the form of a varnished vase shaped like a fruit or a breast which is as agreeable to touch as it is to see. The Orientals have maintained the usual relationship of the sensitivity of the soul – the conductive wire of artistic emotion. That is why their painting, without clashes or hatchings, goes straight to its goal which is the stable and intellectual transposition of our rapid and fugitive visions. 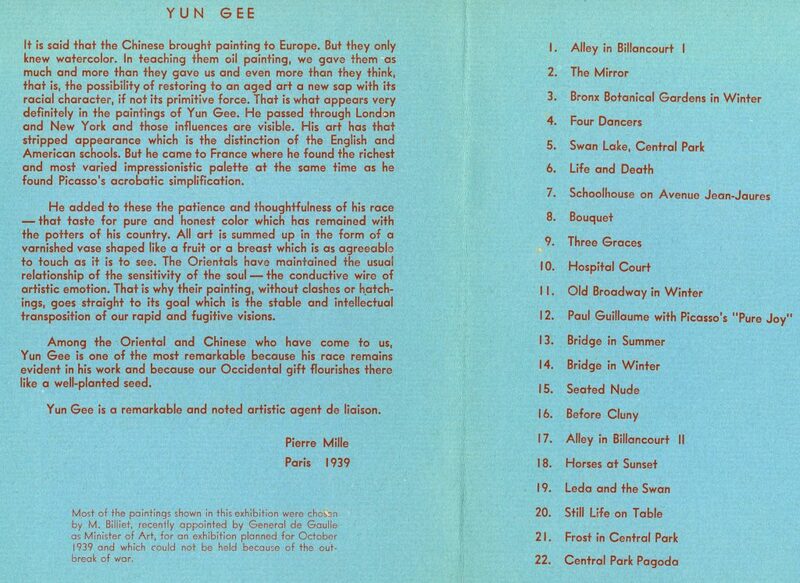 Among the Oriental and Chinese who have come to us, Yun Gee is one of the most remarkable because his race remains evident in his work and because our Occidental gift flourishes there like a well-planted seed. Yun Gee is a remarkable and noted artistic agent de liaison. 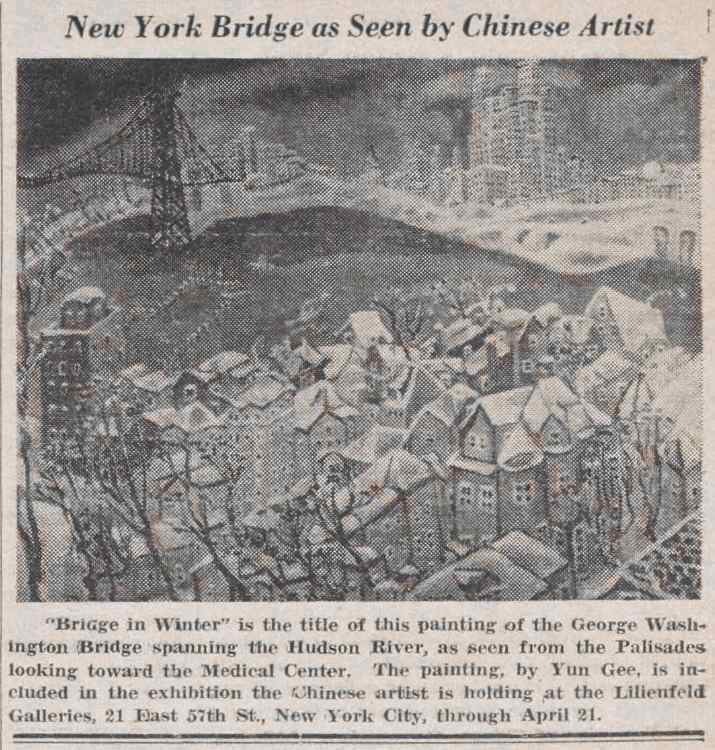 Yun Gee has successfully fused the Chinese and 20th century French art traditions, with American subject matter, into a highly recognizable style entirely his own. Each of his canvases is an inspired opus. They are all invested with a spirit of cheerfulness, a dancing, rhythmic design, and jubilant color. Thousands go in and out of Bronx Botanical Gardens. Many know of its location and great numbers pass by this storehouse of nature’s beauty. But Yun Gee not only sees its pictorial possibilities but waits until Winter comes. Then he creates of its white dome an effect as monumental as our capital’s building. 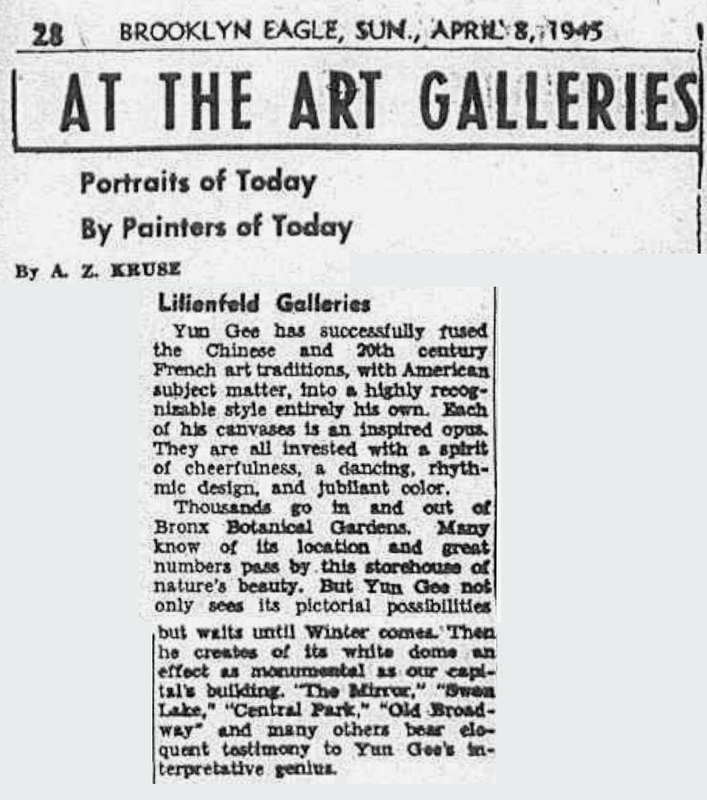 “The Mirror,” “Swan Lake,” “Central Park,” “Old Broadway” and many others bear eloquent testimony to Yun Gee’s interpretive genius.